German based promotion wXw has announced that British Strong Style will be appearing at their 18th Anniversary show. 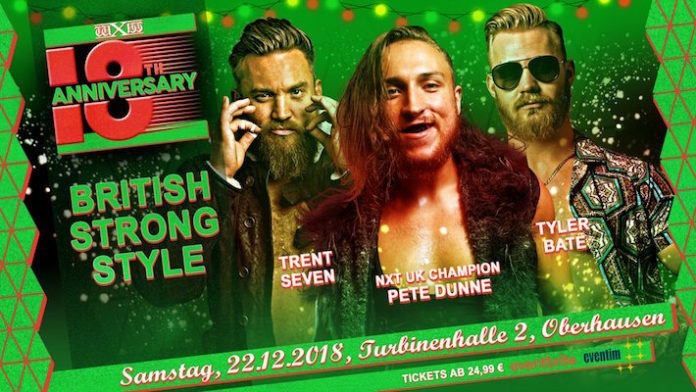 WWE United Kingdom Champion Pete Dunne, Tyler Bate and Trent Seven will be joining the 18th Anniversary show on December 22nd in Oberhausen. This follows the news that NXT Superstar Axel Dieter Jr would be returning for the special Anniversary show. Dieter Jr left wXw back in April of 2017. The German Superstar made his way to NXT but as of yet has not been heavily featured on the WWE Network programme. Dieter Jr finally made his NXT debut in August of this year in a losing effort against Keith Lee. As well as his time in wXw, Dieter Jr had an impressive run for the UK’s PROGRESS promotion. Bouts against The London Riots, The South Pacific Power Trip (TK Cooper and Travis Banks) and The Hunter Brothers alongside WALTER gained him a strong following. Dieter Jr also faced British Strong Style (Pete Dunne, Trent Seven and Tyler Bate) alongside Timothy Thatcher and WALTER. British Strong Style’s opponents have not yet been named for the event. Although a potential Dream Match against Ringkampf’s Axel Dieter Jr, Timothy Thatcher and WALTER could be in order. NXT UK Champion @PeteDunneYxB and Moustache Mountain (@trentseven & @Tyler_Bate) return to Germany to celebrate our 18th Anniversary.